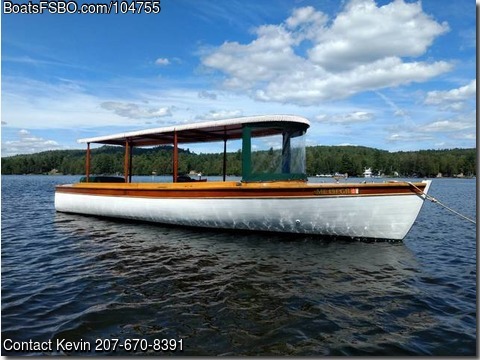 A classic, restored, wood launch built by Goodhue & Hawkins in Wolfeboro, NH on Lake Winnipesaukee. Purchased by current owner in September 2008, she has been the flagship of our highly successful lake cruise business on Rangeley Lake, Maine. This vessel is a beauty! She glides across the water and is a classic laker! Known as the Shady Lady on Lake Winni, now the Oquossoc Lady on Rangeley Lake! Currently in the water on Rangeley Lake and available for viewing and a short cruise to interested and qualified individuals. Reason for sale - we have outgrown the seating capacity (10 passengers plus boat captain) and are purchasing a larger vessel for our growing cruise business. Last surveyed in September 2008 (available upon request) LOA: 28' / Draft: 2' / Skeg keel Original Gray Marine 4 Cylinder engine, Model # 4-168, 50-60hp Surrey top for sun and rain protection Vinyl covered foam seat cushions New custom made Sunbrella weather cover for entire boat Single piece front dodger for cooler trips Two bilge pumps (new 2018) Porta potty under aft seat Tandem axle 'yard trailer' included with sale (no hydraulic breaks) Delivery can be negotiated For more information call Kevin at 207-six seven zero - 83 nine one.